Location: Located just a few kilometers outside of Nafplio. Access: This popular beach can be reached by car or taxi. Facilities: Cafés, restaurants, lounge chairs, parasol rental, showers, toilets, water sports. There is a free parking space. 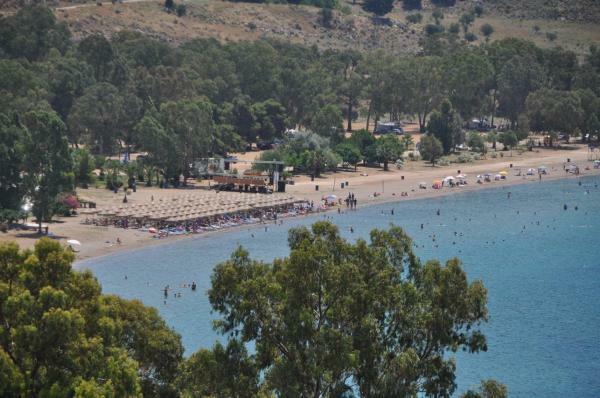 Miscellaneous: Near Karathona beach a grove of eucalyptus trees allows you to enjoy the pleasure of free camping. The entire beach boasts a unique beauty and a breathtaking view. The Castle of Palamidi stands on the left while opposite the beach, on can clearly see the coastline of Kynourias.